1. 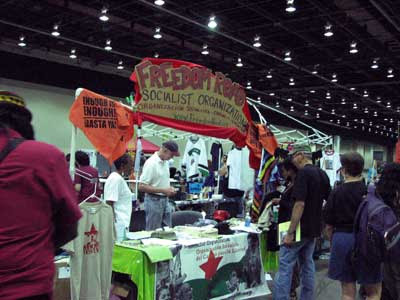 The USSF, a national offshoot of the World Social Forum, is probably the best reflection, however distorted, of where the motion for social justice and revolutionary change is at in this country today. There were upward of 9,000 registrants, and a significant number who skated registering entirely. The crowd skewed young, notably younger than the first Social Forum in Atlanta in 2007, and featured a genuinely heartening mix of nationalities. Organizationally, the great majority who came from outside of Detroit itself were associated with groups from the social movements--tenants, immigrants, environmentalists, education activists, small farmers, etc. Hundreds were part of what is sometimes called the Party Left--members and sympathizers of organized socialist groups. Throw in the anarchists and you’re into the four figures. A couple of old friends remarked to me that the labor movement wasn’t there. That’s wrong. True, the showing from the trade union movement was disappointing, though hardly non-existent, but new workers organizations based among the urban and rural poor and especially among immigrants were well represented--Florida alone had good size contingents from the Miami Workers Center and the Coalition of Immokalee Workers. This might be an example of the distortion I mentioned, but it is also a look at where the action in the working class currently is and at the likely future of the class struggle in the US. 2. The thing that dismayed me most was the scant attention paid to the deadly occupations of Iraq and Afghanistan being waged by our government, in our name, with our tax dollars. Eric See of Peace Action West pointed out to me within minutes of my arrival that only a dozen of the over 1000 workshops were devoted to understanding and ending the wars. The People’s Movement Assembly (an organizational form to try and concentrate ideas and develop positions at the USSF) about the wars that I attended never had more than 80 people in the room during its 4 1/2 hours. At least 80% were over 50 (or had lived insanely dissolute lives). Despite some thoughtful speakers and a couple of, erm, energetic shall we say, panelists, it was depressing and hard to stay awake in. This too is a reflection of where the movement is at, and not at all a criticism of Social Forum organizers. Almost anybody who wanted to organize a USSF workshop was approved and the small number of workshops simply confirms the enfeebled and disoriented state of the anti-war movement as a whole. Michael Zweig of US Labor Against the War mentioned that one striking feature of the workshops he spoke at or attended on the topic was the very low level of participation from young folks. Why, he wondered, were the wars in Iraq and Afghanistan not on the radar of the bright and dynamic young activists who thronged Cobo Hall? Veterans For Peace made a point I wish had been taken more seriously by USSF participants. Several members dropped a huge banner from one of Detroit’s many, many abandoned multi story buildings; it read “How Is The War Economy Working For You?” This should serve as a blunt reminder that no matter what we are trying to win or even defend, the money for it is not going to be there if we continue to permit hundreds of billions of dollars to be dumped into these unjust and unjustifiable wars. In a funny way, the USSF is organized along the lines of Adam Smith’s “invisible hand” view of the capitalist economy. Each group pursuing its own immediate interests contributes to building the strongest movement for the greatest number. As a Marxist rather than a neo-liberal, I find that some shortcomings in this conception jumped out at me, for instance, every time I was braced by an outfit which passionately believes that only their “rare and precious” genius of a chairman can save humanity, and therefore that their sole responsibility is to convert the uninitiated to this understanding. This conception also tends to render meaningless the process of having a hundred or so People’s Movement Assemblies (or, frankly, a handful of people within them) generate statements which are to be debated and voted on by whatever portion of USSF attendees can bear to sit through the grueling closing sessions designed for the purpose. And then what? An enormous amount of work and resources went into bringing the Detroit USSF into being, like Atlanta before it, and this is work for which the payoff is not immediately obvious, so let me highlight a few of the things we can be sure will result from Detroit. One is simple crossfertilization, which flourished whenever folks weren’t too singleminded in pumping their own projects. To cite a striking example, hundreds of folks attended workshops on urban gardening or took the USSF-arranged tours of Detroit’s extensive networks of such gardens, and went home with a head full of ideas and a whole new way of thinking about city living. One of the greatest benefits will probably unfold in the coming months, advances in communication and organization in various sectors, outside of the USSF framework. For instance, face to face contact among organizers and activists in Atlanta in 2007 gave rise to the National Domestic Workers Alliance, a major initiative among some of the most exploited workers in the US. Atlanta also introduced many US farm activists in the US to La Via Campesina, the international coalition which is a mainstay of the World Social Forum and “coordinates peasant organizations of small and middle-scale producers, agricultural workers, rural women, and indigenous communities from Asia, Africa, America, and Europe"
Finally and, I would argue, most importantly, the Social Forum gave thousands of us a real taste, if only for a few days, of how much might be possible if we in the US can build a revolutionary socialist organization of tens of thousands based in mass movements, in communities of color, among immigrants, in the working class majority in this country. Thanks for your "report back" & observations. At least you stayed for the PMA. I couldn't bear it after the initial presentations, & left to others with more engaging interaction. Houston has been doing "report backs" presentations to various orgs & on KPFT (Pacifica affiliate). I'm presenting & discussing with Houston Peace Forum Thrs. pm & was browsing for any other criticism/self-criticsm that would contribute to the conversation. Your impressions were similar to mine & I've pulled the Vets pic to include in my ppt. Good reminder that no matter what social movement (with a small m") that we're involved with , nothing much will be accomplished without ending the occupations/wars & ending wasted billions of dollars that could go to human needs & social progress...sigh. I'm going to start asking that question all the time: So how is the war economy thang working for you? !